We had just missed their $20 special which included a pizza, glass of wine, and dessert – by only 30 minutes! What a great deal, but we missed it because we were having too much fun being glamorous at the famous Hollywood sign 😀 My cousin, Angela, her fiancé, Josh, Adam and I had dinner at Pizzeria Mozza, one restaurant of the many restaurants within the empire built by celebrity chef, Mario Batali, and his business partner, Joe Bastianich. 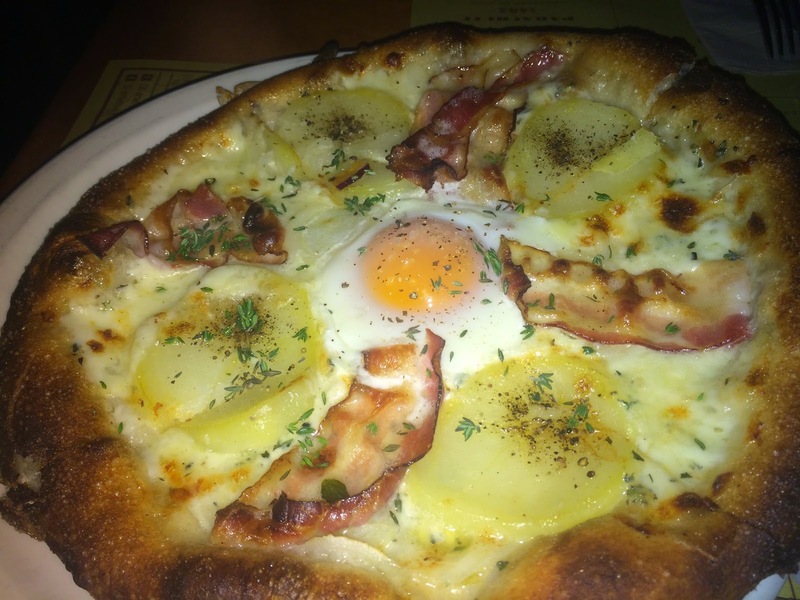 Pizzeria Mozza was established when Mario and Joe teamed up with well known award winning chef, Nancy Silverton. Nancy Silverton recently won Outstanding Chef by the James Beard Foundation in 2014, but that was not her first James Beard Foundation award. Lastly, Pizzeria Mozza’s pastry chef, Dahlia Narvaez, is this years semifinalist for the James Beard Foundation’s Outstanding Pastry Chef Award. You can see why I wanted to visit this restaurant so badly. The four of us shared three pizzas, and I thought they were all amazing! Adam thought they were “okay” – I think he is used to his St. Louis style pizza too much haha. 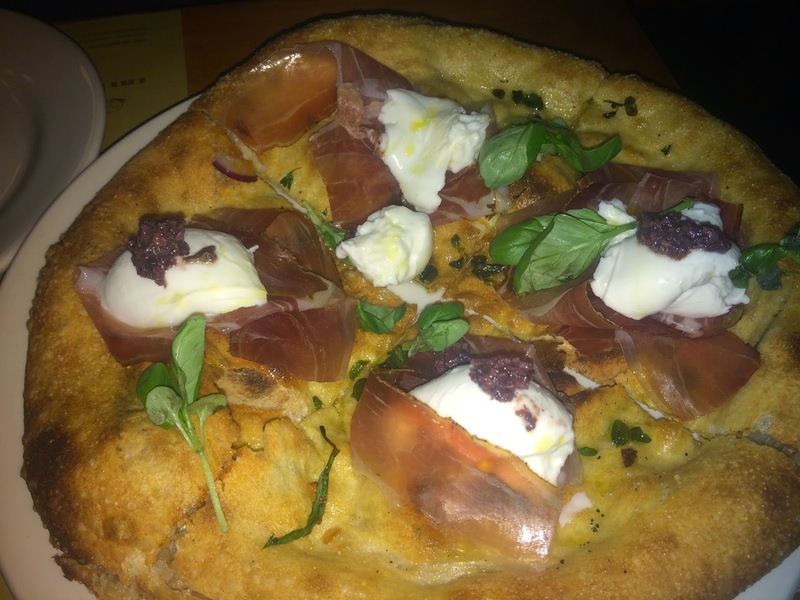 The first pizza had Egg, Bacon, Yukon Gold Potato; the second had Bermuda Onions, Speck, Mozzarella di Bufala, Olive Tapenade and Oregano; and finally, the third had Prosciutto di Parma, Rucola, Tomato & Mozzarella. 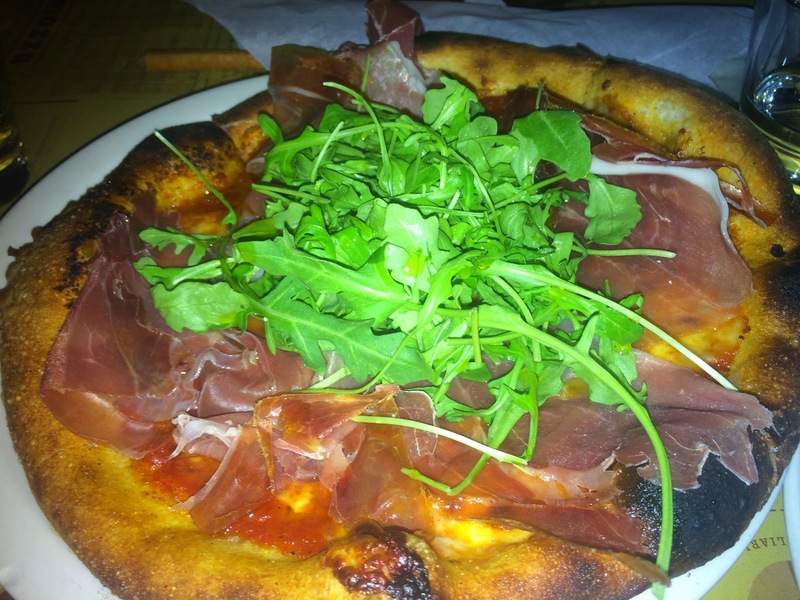 Every pizza was made with the freshest ingredients, a thin and crispy crust, and an amazingly delicious marinara sauce! Some of the best pizzas I’ve ever had. Adam and I have work to do on our own homemade pizzas, thats for sure! This dessert was surprisingly good! Angela and Josh ordered it and were generous to share with us. Banana pie is a dessert I never really go for because it is not my favorite, but this dessert made me love banana pie. This dessert was the most playful on the menu with an Italian take on an American banana split. The classic flavors of banana, hot fudge, and nuts (in this case, hazelnuts), is simple but done very well here. 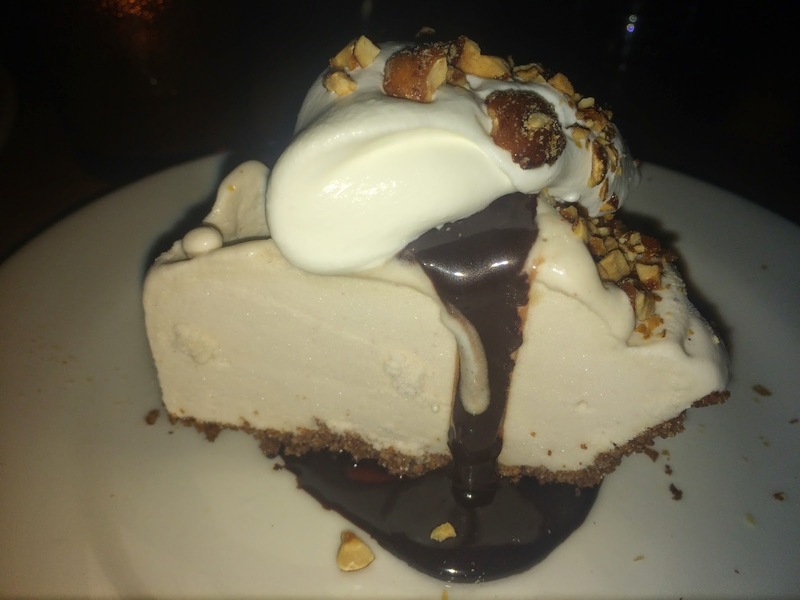 We got a perfect slice of the banana gelato pie with hot fudge slowly dripping down the sides, and a beautiful dollop of whipped cream on top that was garnished with hazelnuts. It is sometimes hard to extract the real, natural flavor of some ingredients, but the banana gelato pie did not disappoint. You could really taste the banana with every bite even with its accompanying components. The hazelnuts add a nice crunch to give a contrast of texture to the smooth, creamy, frozen dessert. All around success! This really was a bittersweet dessert, maybe a little too bitter for my taste buds, but I did appreciate it and found it delicious. 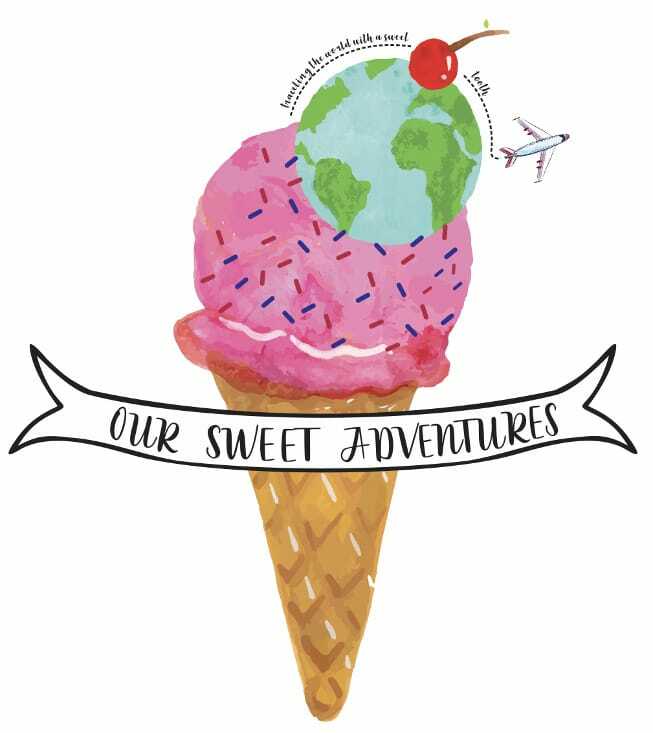 A tartufo means “truffle” in Italian and is an Italian ice-cream dessert composed of two or more flavors of ice cream. A tartufo typically has a cherry in the middle that is dipped in chocolate and covered in nuts. However, Chef Dahlia, has her own take on Italy’s traditional ice-cream dessert. This tartufo was just bittersweet chocolate ice cream dipped in chocolate with a spoonful of gelato on top. You may think this is a lot of ice cream, but the tartufo is a different texture than the scoop of gelato. The bittersweet chocolate tartufo was dense, rich and sinful. The lemon-olive oil around the plate helped balance the richness of the tartufo. 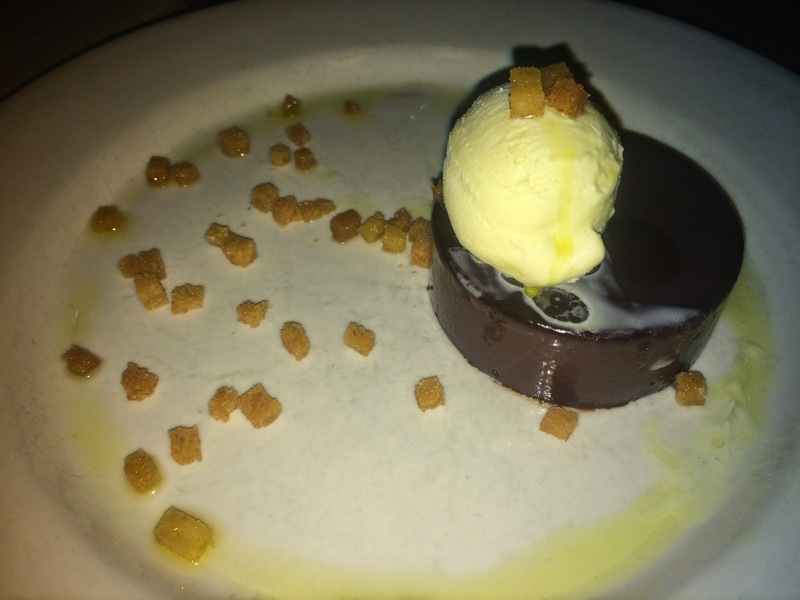 The acidity from the lemon-olive oil throughout the dessert complimented the richness from the chocolate. 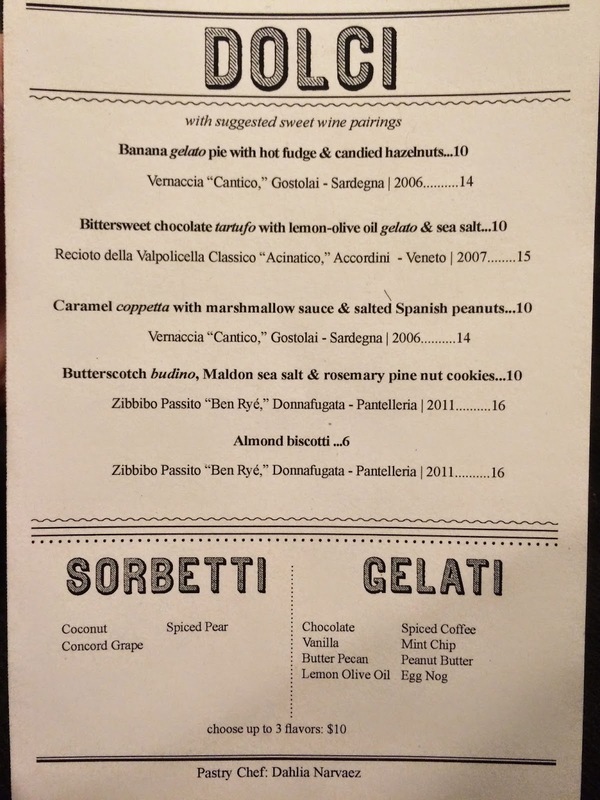 Now for my favorite part of the entire evening, the lemon-olive oil gelato…..so amazing!!!! It is the reason I wanted this dessert in the first place, it is unique and something you definitely do not see on a menu everyday. Next time I will be more than satisfied to just have a bowl of this gelato.